8 powerful anti-ageing peptides and omega fatty acids for firmer, stronger, healthy-looking skin. Nourish and rejuvenate very dry skin in two simple steps with this powerful duo. Peptide Booster is a mix of 8 potent peptides that teach skin to look and act younger, improving the appearance of fine lines and wrinkles, loss of firmness and uneven skin tone. Deeply nourishing, the Omega serum feeds skin with omega fatty acids, potent antioxidants and skin-restoring ceramides. Together, these products strengthen and support the skin’s natural barrier, leaving skin firmer, more resilient and younger-looking. Use both products after cleansing, toning and exfoliating. Apply the booster then follow with the serum, or blend the booster with the serum. Apply onto face, neck and eye area. During the day, always follow with a moisturiser containing a broad-spectrum sunscreen rated SPF 30 or greater. If applying at night, follow with a night cream. 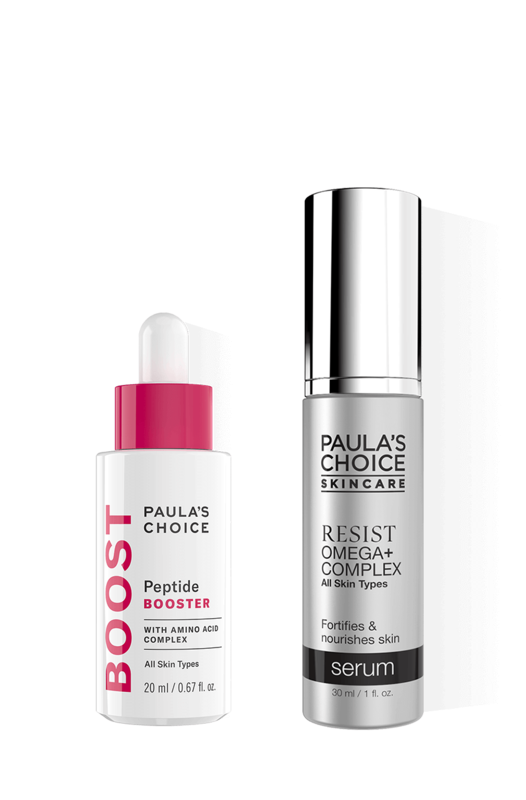 Can I use Peptide Booster if I have sensitive or rosacea-prone skin? Using Peptide Booster is not a problem if you have sensitive or rosacea-prone skin. In fact, Peptide Booster is a great choice for anyone who cannot tolerate our higher-strength retinol products. Can I mix Peptide Booster with other products? Peptide booster can be used alone or mixed with a serum, nighttime moisturiser or another booster. Who is the Omega Serum for? Resist Omega+ Complex Serum is ideal for anyone struggling with dry, dehydrated skin that’s showing signs of fatigue and visible signs of ageing such as fine lines and wrinkles. It's also excellent for anyone with sensitive or compromised skin.